The National Immunization Programme (at the time known as the Expanded Programme on Immunization – EPI) was initiated in 1979 in three districts with only two antigens (BCG and DPT) and was rapidly expanded to include all 75 districts with all six recommended antigens (BCG, DTP, OPV, and measles) by 1988. In 2003, with the support of the GAVI Alliance, monovalent Hepatitis B (HepB) vaccine was introduced, which was later administered as a single tetravalent (DPT-HepB) injection. In 2009, vaccination against Haemophilus influenzae type b was introduced through out the nation in a phase wise manner starting in Far Western (FWDR) and Western (WDR) Development Regions. Also in 2009, Japanese encephalitis (JE) vaccine was introduced into the routine immunizationprogramme in 16 JE endemic districts following JE mass vaccination campaigns. 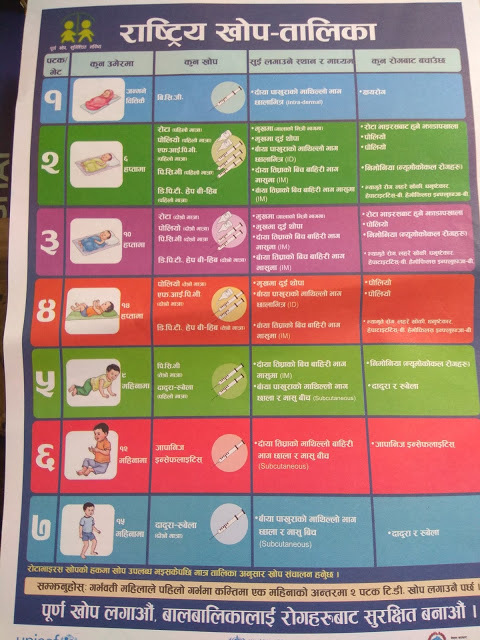 The National Immunization schedule of Nepal has included Rota viral vaccine over existing 11 Antigens. Rota virus is the leading cause of Acute viral diarrhea in children and leads to substantial mortality and morbidity. The vaccine is given Orally at 6 and 10 weeks. The proposed Rota viral vaccine has been postponed for this fiscal year. 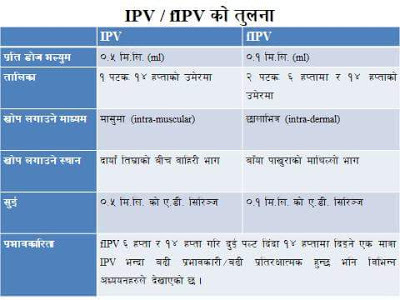 About Fractional dose of IPV : As an alternative to the intramuscular injection of a full dose of IPV, countries may consider using fractional doses (1/5 of the full IPV dose) via the intradermal route.In the context of an IPV shortage, countries should consider instituting a 2-dose fractional dose schedule, where feasible, fIPV has been introduced at 6 and 14 weeks in our schedule as recommended by WHO. 1979 Started immunization program with BCG and OPV in three districts. 1988 Nationwide immunization program with BCG, OPV, DTP, Measles. 1996 First nationwide polio immunization campaign. 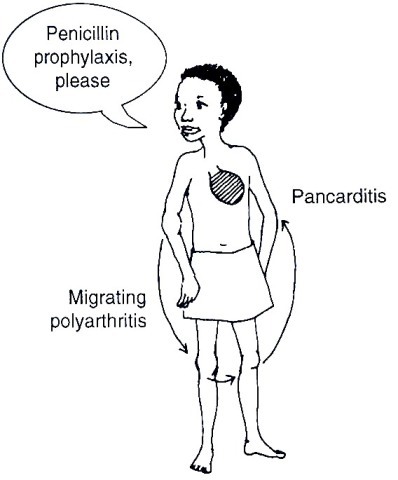 Last reported indigenous case of poliomyelitis in Nepal. Program expands to 14 surveillance field offices (10 in 2005). National Expert Review Committee starts virological classification of AFP cases. AFP surveillance achieves internationally accepted standards. 2003 Measles and tetanus surveillance integrated into AFP surveillance network. National Public Health Laboratory accredited by WHO as a National Laboratory for Measles surveillance. National immunization injection safety policy Hepatitis B included in the routine immunization schedule. Surveillance for acute encephalitis syndrome (AES) for Japanese encephalitis (JE) integrated into AFP surveillance. Nationwide Measles catch up immunization campaign initiated (2004-2005, in three phases). 2006 Japanese encephalitis catch up campaigns initiated in high risk districts. International and national AFP surveillance review. 2007 Measles case-based surveillance initiated. 2008 Measles follow up campaign integrated with OPV nationwide (in two phases). Rubella burden of disease studies initiated. National Committee for Immunization Practice Formed. 2009 Hib vaccine included in the routine immunization schedule. JE vaccine included in the routine immunization schedule in 17 districts that completed catch up campaigns. EPI coverage survey. Sentinel surveillance site for rotavirus initiated. Sentinel sites for Hib disease expanded to include pneumococcal disease. Initiated pneumonia surveillance to support H5N1, H1N1 influenza through AFP surveillance network. Provided technical support for cholera outbreak in Mid West Development Region. 2010 International and national review of vaccine preventable diseases and EPI.